San Diego, CA – On St. Patrick’s Day, California’s southernmost metropolis decided to debut a roadside test for those suspected of driving under the influence of cannabis. Several “sobriety checkpoints” were set up throughout the city with the standard invasions of privacy, but this time they added a mouth swab test known as the Drager 5000. If a cop suspects a driver of being high, they request that he or she take the mouth swab test, and perhaps a field sobriety test as well. They’re trying to gather evidence to incriminate you, although the mouth swab test is not mandatory. The Drager 5000, already in use in other countries and cities such as Los Angeles and New York, detects the presence of various substances, including THC, the psychoactive ingredient in cannabis. The problem is, this test has absolutely zero ability to test actual impairment or level of intoxication. “Officers trained to recognize the symptoms of drug impairment will first look for various indicators that a driver is high, from an unsafe driving maneuver to bloodshot eyes to the odor of marijuana to blank stares, San Diego police Officer Emilio Ramirez said. Once there is ample suspicion of drug use, the officer can then request to perform field sobriety tests or for a driver to take the Dräger 5000 test. If the driver refuses at that point, the officer can force the person to submit to a blood test. To use the machine, the driver is handed a mouth swab and instructed to run it around the inside of the mouth for up to four minutes. The swab is then placed into the machine, along with a vial of testing solution, and the machine does its work. It takes about six to eight minutes for results to print out on a receipt. And if you can’t make bail, you’ll be sitting in jail for weeks or months awaiting the blood test results. For many people, this would mean being fired from their job, or being ripped away from their family, or some other life-altering repercussion – all because a cop invaded your privacy at an unconstitutional roadblock. The Drager 5000 can give positive results for THC even if the person did not even use cannabis that day. If it’s legal to use cannabis – as in California – and the swab test can detect THC from days prior, there is absolutely no rationale for deploying the machine. Despite the fact that someone can be perfectly sober and still test positive, this “evidence” is admissible in court. The funny thing is, results from St. Patrick’s Day field sobriety checkpoints showed a decrease in the number of DUI arrests. At one checkpoint, six people were arrested, down from nearly a dozen the year before. One person was going to submit to the mouth swab test for cannabis, but the ordeal gave him an anxiety attack that required medical attention. The cops went ahead and arrested him for DUI afterward. “We did have one person, who was going to submit a test, but unfortunately had some sort of anxiety attack in secondary to the point where we actually had to get medical attention for him and then later arrested him for DUI,” said Officer Mark McCollough. 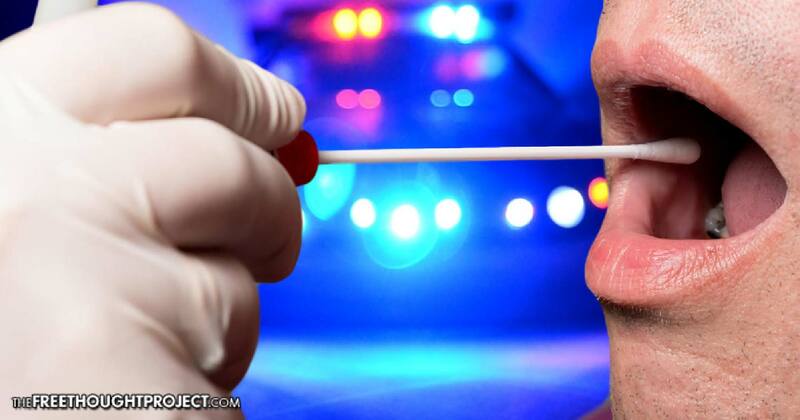 Clearly, the Drager 5000 mouth swab test serves no actual purpose in addressing impaired driving, but is just another tool of the police state being rationalized by cannabis decriminalization.